Alpha Design Labs (ADL) has just introduced an all-new product – the STRATOS. Building on the features of the GT-40 the ADL STRATOS brings something new to the table – DSD capability, a first for ADL. The STRATOS is truly a jack of all trades and quite possibly a master of many, having a built-in preamplifier, phono stage, headphone amplifier, DAC & ADC (24-bit/192-kHz), as well as DSD functionality (both 2.8M and 5.6M) via USB connection. S/PDIF optical input and output are also provided. The STRATOS can thus serve as the hub of a music system and/or a work-horse of a desktop system. With it you can create pristine digital versions of your LP vinyl albums or get the most out of your headphones with robust amplification and the audiophile quality DAC. 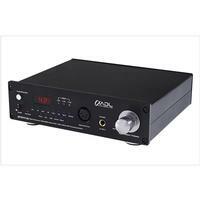 Additional features include L/R analog inputs, switchable line or phono inputs and a controller that supports both ASIO and Asynchronous modes. The STRATOS also uses the finest Furutech RCA sockets to deliver high-quality sonic results. A clear step-up from the GT40 in performance, the STRATOS, has been reconsidered and rethought using the latest technology and the latest designs. "So, what do I think about the STRATOS? I'm enamored of it. It may be the single greatest piece of equipment that has graced my house." Read the full review from Positive Feedback, here. "So then -- is the ADL Stratos the one “preamplifier” to rule them all? For a good many music lovers out there, and with the types of systems it’s likely to be used in, the answer will be an enthusiastic yes." Read the full review from Soundstage Acess, here. • Analog-to-Digital Converter: The STRATOS sports a high-performance ADC IC (CS5340) chip for high resolution recordings via analog inputs including phono, AM/FM radio, or other analog signals.